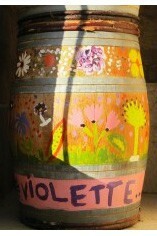 La Violette is the true jewel in the Péré-Vergé Pomerol crown! The Bordeux wine made its debut for Catherine Péré-Vergé 2006. The small vineyard is located on the top of the Pomerol plateau. The old vine merlot planted in the vineyard is close to 50 years old. In fact, many of the vines are even older. The vineyard is not far from Chateau Le Pin and Chateau Trotanoy. La Violette is one of the most exciting wines made in Pomerol today. Popular several decades ago, the property was behind other Pomerol wines s in quality, prior to 2006. By the time 2008 finished Malolactic fermentation, it was obvious this was an off the charts wine! It’s filled with countless layers of dense, rich, opulent dark berry, floral and chocolate tones. The palate enjoys a bath of pure velvet and satin. One of the key characteristics of this Bordeaux wine is the haunting smell of violets. Good luck finding any. On average they only produce about 400 cases. In 2008, they made closer to 250! Jean-Christophe Meyrou manages the property as well as Chateau Le Gay. He is also in charge of Chateau Montviel and the Pere-Verge estate in Argentina.